Grimm fairy tales Archives - Joelle Delbourgo Associates, Inc. Some fairy tales are too silly. Others are too serious. But when the Muppets meet the classics? The stories are just right! 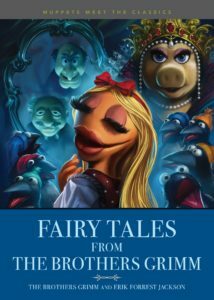 Join Kermit the Frog, Miss Piggy, and the other Muppets as they bring favorite fairy tales to life in their own hilarious way. Erik Forrest Jackson is back for more Muppets after the first hilarious mash-up, Muppets Meet the Classics: The Phantom of the Opera. He spent more than a decade as an executive editor for magazines including Entertainment Weekly and InStyle. As an award-winning dramatist, his work has been produced internationally and includes Like a Billion Likes (winner of the Southwest Playwriting Competition and the Chesley/Bumbalo Foundation Playwriting Award); the Neil Sedaka musical Breaking Up Is Hard to Do; Carrie, a black-comedy adaptation of Stephen King’s novel; the Off Broadway comic thriller Tell-Tale (Best Play GLAAD nomination); and Cheers Live on Stage, a theatrical version of the beloved TV series. His poems were featured in the Showtime film The Escape, starring Patrick Dempsey, and his articles have appeared in Glamour, W, Real Simple, Allure, and Town & Country. He grew up in Texas, studied acting and poetry at the University of Southern California, and now lives in Harlem, New York.